Talk about no brainers, gimme a break. 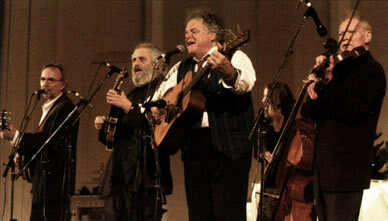 David Grisman, Peter Rowan, Vassar Clements, and Herb Pedersen, with Bryn Bright on standup bass, what do you expect? Greatness, and that's what you get. It's beyond mere virtuosity, and even legend. It's personality, fraternity, and spirit. The four gentlemen have well over a century of stage experience between them. Vassar sings bass, and the three others can sing lead or backup, in various ranges. As with the original Old and In the Way record from '75, the quality of this ensemble I find additionally entertaining is the "whacked" nature of the improvising in passages. It's never belabored or even emphasized, but Grisman or Vassar in particular will get "outside" in a heartbeat, often comically. And when they're burning the bluegrass down, they rip it with the best, like on "Barefoot Nellie." Many classics are covered: Bill Monroe, Ira Louvin, Carter Stanley, Townes Van Zandt, and a pair by the late John Duffey, who co-founded The Seldom Scene, including one with fellow Country Gentleman Charlie Waller, "Two Little Boys." "Vassar's Fiddle Rag," and two Peter Rowan tunes, "Meadow Green" and "Rainmaker," comprise the originals on the disc. The breakneck version of "Honky Tonk Women" is a real hoot and must be the show closer. Two greats from the original group are gone, John Kahn and Jerry Garcia. But the colorful percussive banjo style and legendary vocals of Herb Pedersen bring a new and different snap to the sound. Bryn Bright is a respected grasser, best known for her instrumental work with husband Billy, on Blue Corn Music (the same small label that debuted Caroline Herring). They've been backing up the likes of Rowan, Tony Rice, and Vassar Clements for some years.